FreshMarine.com - Black Greek Tortoises - Testudo graeca ibera - Buy Black Greek Tortoises Now and Save! Black Greek Tortoise is one of five species of Mediterranean tortoise. Their binomial name is Testudo GraecaIbera. They are known for their large conical tubercle on each thigh. Adults can grow up to 7 inches and females are usually larger than males. Their lifespan of Black Greek Tortoise is about fifty years. 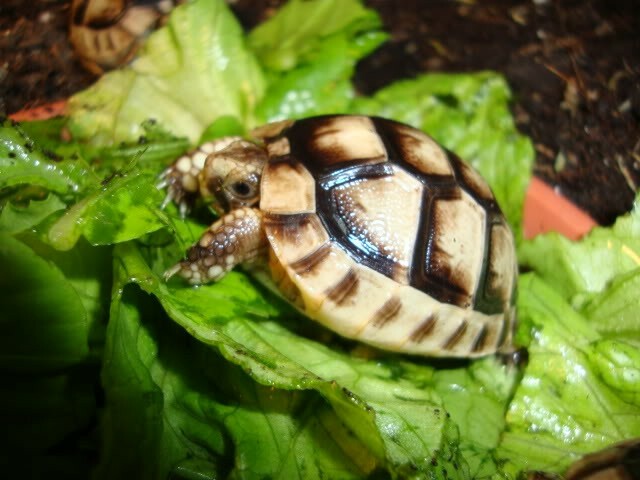 They are very often confused with Hermann�s tortoise but some of their characteristics are distinct. Large symmetrical markings on the top of their head and large scales on the front legs help to differentiate Black Greek Tortoise from Hermann�s tortoise. Their carapace is undivided and stretches over the tail. It is also oblong rectangular in shape. There are also visible and notable spurs present on each thigh. One can also notice isolated flecks on the spine and the rib plates. Spinal plates are widely stretched and the posterior plates on underside are movable. As in all the other species of tortoises, Testudo GraecaIbera males are also dissimilar from females. Males are generally smaller but their tales are longer than their counterpart. Males� underside is somewhat curved but the females have a flat plastron. Male�s carapace is wider and the plates on the carapace often overhang outward. The mating instinct starts up soon after they wake up from hibernation. Males encircle the females, bite them, ram them and try to mount them. They also show their red tongue and make noises during copulation. With one successful mating, female can lay eggs multiple times. One or two weeks before laying the eggs, females become agitated. They move around, smell and even taste the dirt to choose an ideal spot for laying eggs. This species is found in Southern Spain, Northern Africa, eastern Europa and Middle East area. These places are exceptionally hot in summers but do not have a high humidity level. For their artificial enclosure, an adult Black Greek Tortoise will require 4 foot long and 2 foot wide terrarium which should also be 2 foot deep. These tortoises do well in indoors. Infrared bulbs and incandescent basking bulbs can provide them heat and light whereas UVB should also be used for up to 14 hours a day. Temperature should vary between 75 and 85 degree Fahrenheit. Humidity level should not increase 50%. If humidity level is high, it can cause many health problems for the pet. A hide spot is also essential which can be made of rocks, wood or plastic containers. For drinking and soaking purpose, place a water dish inside the terrarium. Black Greek Tortoises cannot swim so the water dish should be shallow. Black Greek Tortoises are strictly herbivorous. Their diet should be high in fiber and calcium and low in protein. Their daily diet should contain dark, leafy greens such as collard greens, mustard greens, red leaf lettuce and natural grasses and hays. They can have an occasional piece of fruit and should only make about 10% of their diet. Their need of calcium should be met by sprinkling calcium supplements of their food items.